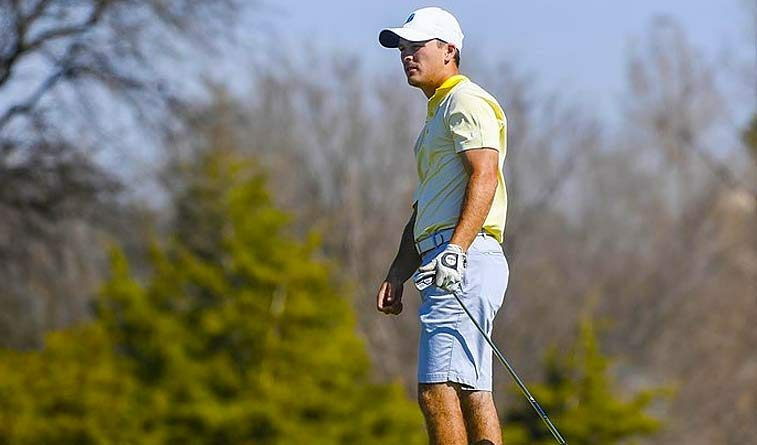 TOPEKA, Kan. (Oct. 17) — Blake Berry‘s two-under-par 69 led the way for Central Oklahoma as the Bronchos finished second in the Washburn Invitational here Tuesday following a playoff loss to Lindenwood. UCO shot a final-round 291 at the 6,647-yard, par-71 Topeka Country Club to finish the two-day, 54-hole tournament with an 872 total, which tied them with the Lions for the tournament lead before Lindenwood won the first-place trophy on the first hole of the playoff. Host Washburn was third in the 17-team field at 880, followed by Winona State (891) and Central Missouri (896). Berry’s 69 tied for the low round of the day to pace the Bronchos. Nick Pierce shot a one-over 72, whle Alexander Hughes had a 74, Wesley Jackson a 76 and Eli Armstrong a 77. Jackson came in third in the individual standings with a one-over 214 total after making 11 birdies in the two-day event. Piece tied for 11th at 220, while Hughes and Berry tied for 13th. UCO ends the five-tournament fall season next week, going to Grove, Okla. for the Missouri Southern Fall Invitational at Shangri-La Golf Resort. The Bronchos have won two titles and finished second twice this fall. Northeastern State slipped a pair of spots in the final round of the Washburn Invitational on Tuesday and finished in eighth place. The RiverHawks carded a 315 in the final 18-holes behind Ty Shelnutt‘s team low 76 score. Hunter Pennington carded a 77 with the rest of NSU’s squad fielding an 81. Bryce Newton had NSU’s overall low score after three-rounds with a 223 (72-70-81) and was tied for 20th on the leader board, Shelnutt was a shot back (75-73-76) tied for 22nd overall. Pennington had the most consistent score for the RiverHawks in Topeka with three-straight rounds at 77 and scored a 231 which was tied for 47th. Navid Majidi and Garrett McDaniel both were tied after the tournament with a 239 which landed the pair in 77th place. Northeastern State finished the tournament with a 910 (301-294-315) and were 29 shots off of the lead. Tuesday’s round completed the RiverHawks fall section of the schedule and they will return to the course in February.